a book review by Rita Lorraine Hubbard: Clara: The (Mostly) True Story of the Rhinoceros Who Dazzled Kings, Inspired Artists, and Won the Hearts of Everyone . . . While She Ate Her Way Up and Down a Continent! Clara: The (Mostly) True Story of the Rhinoceros Who Dazzled Kings, Inspired Artists, and Won the Hearts of Everyone . . . While She Ate Her Way Up and Down a Continent! 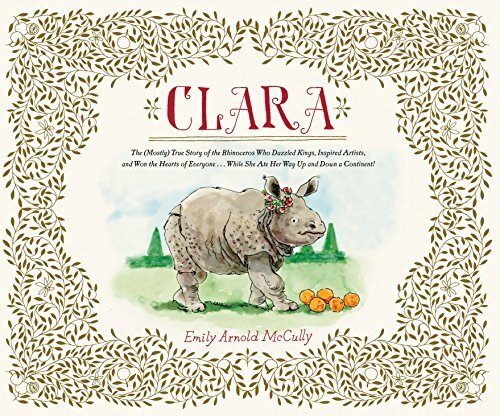 It’s pretty astonishing that an animal dubbed as “monstrous” and “frightful” could win the hearts of people from one end of Europe to the other, but that is exactly what happens in author Emily Arnold McCully’s latest adorable picture book, Clara: The (Mostly) True Story of the Rhinoceros Who Dazzled Kings, Inspired Artists and Won the Hearts of Everyone . . . While She Ate Her Way Up and Down a Continent! In the book, an old Dutch sea captain named Van der Meer longs to leave his lonely sea life. When he visits a friend in India and is greeted by an astonishing creature—a thick, sturdy rhinoceros with soft, smiling eyes, he knows just what he will do next. Since Europeans believe rhinos are mythical, Van der Meer decides he will haul the rhinoceros around Europe and charge people to see her. His friend agrees to sell her, so the good captain hoists her onto his ship and proceeds to “show” her to all who will pay. As they arrive at each destination, Clara (as she is called) is hauled around in the wooden wagon built just for her. She meets all sorts of royalty: Frederick the Great, king of Prussia; Empress Maria Theresa of Vienna; Frederick II of Hesse; and Louis XV of Europe. She also meets plenty of commoners, and they all love her so much that the women insist on wearing their hair as high atop their heads as possible to mimic the horn that has magically appeared on Clara’s forehead. They also wear la rhinoceros gowns to honor Clara. Before long, painters paint Clara, the French navy christens a new ship for her, and everyone flocks to see the beast with the noble eyes. As the years go by, Clara gets bigger and bigger, and when her horn falls off one day, an even bigger horn grows to replace it. Clara becomes so humongous that she almost literally eats captain Van der Meer out of house and home, but it’s worth it for him. His “Clarakin,” as he calls her, is the perfect companion for his lonely soul. Readers young and old will learn plenty when they read this book. They’ll learn that rhinos dry up in the sun unless they have access to water (or in Clara’s case, fish oil from the sea). They learn that ships from the olden times typically carried live animals like chickens, goats, and pigs so that they would have fresh milk, eggs—and possibly bacon (although slaughtering pigs was never mentioned). They’ll learn that a rhino’s horn falls off like a fingernail or toenail, and another one eventually grows in its place. But perhaps most astonishing of all, they’ll learn just what an animal that weighs more than five thousand pounds eats and drinks every single day: namely, oranges, grass, 30 loaves of bread, 100 pounds of hay, and 14 buckets of water and beer. Of course, years later, society has learned that this is not the proper diet for a rhino, but it certainly kept Clara alive and kicking for many years. This book is a history, zoology and geography lesson all rolled into 5,000 pounds of soulful-eyed fun. It should be noted that the text seems wordy at first sight—especially considering that the book specifically targets ages four to eight. However, the story is so amazing, and the full, sweeping illustrations are so adorable that the wordiness seems to disappear into thin air, much like those hundreds of pounds of food that Clara gulped down every day.